"At some 80-feet in length, Sanderson’s dramatic, glowing onyx Long Bar has been remodelled with nature in mind, dripping with climbing vines, hanging plants and decadent floral displays, creating a mesmerising focal attraction. 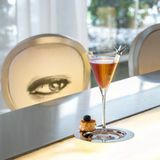 Renowned for its delectable cocktails, Sanderson is delighted to introduce “Signature Cocktails” - Long Bar’s cutting-edge menu. With sbe’s core values at the forefront of the creation of their latest concept, the exciting new menu is an exploration of Authenticity, Innovation, Mastery and Sophistication. 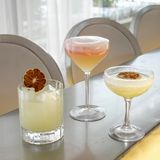 In addition, guests can sit and savour “Sanderson Classics” - the complete collection of Sanderson’s all time favourite cocktails. 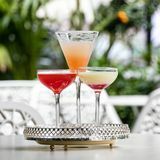 From Deluxe Mojitos to Jasmine Margaritas, this tempting range of classic cocktails are perfect to enjoy in one of London’s most opulent locations. 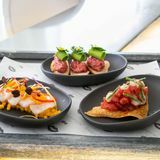 Guests can also enjoy a wide selection of small plates and bigger bites from the light, white and airy surroundings. The bar comes to life throughout the week with DJ’s and events bringing the ambience to the table. Kick the first Wednesday of every month off with Sanderson Sessions with live music from Monroe. Heading into mid-week with Do Not Disturb by Kevin O’Leary on Thursday nights, full of funky house and classics. Then dance the weekend away with our uplifting house and classics DJ residencies on Friday and Saturday until the early hours." By sending this booking your details will only be sent to Long Bar and will never be shared with other third parties. By clicking this box you agree to the Terms and Conditions set out above. You can book to reserve an area of Long Bar for you and your friends. Just enter your requirements below to see what they have to offer. Classic and innovative cocktails fill the seasonally changing menu, with guests also being able to enjoy a wide selection of sharing platters. Beautiful urban haven in the middle of the hotel open all day. Terrace surrounded by fruit trees. What did you think of Long Bar? The living and breathing antithesis to the stereotypical stuffy luxury hotel bar, The Long Bar at the 5-star Sanderson Hotel has a party streak that some clubs and bars would kill for. Located on the ground floor of the Sanderson Hotel, The Long Bar stretches down to the right of the main entrance until it dog-legs to the left and turns into Suka, a modern pan-Asian restaurant. As it’s made out of swathes of glass, you can see from the bar into the restaurant and vice versa. The bar itself is bright, white, skinny and lengthy, naturally. The focal point for the whole room is the back-lit ivory bar, a feature that attracts those with Louboutin heels and Chanel bags like moths to a naked flame. In addition, it has a huge selling point in a sheltered courtyard area, which has babbling water features, egg-shaped swing chairs and a fashionable, international vibe. Once the working day is done, expect a good-looking, designer-clad, party-centric crowd to congregate around the bar. With seating at a premium – unless you get a tall stool at the bar, tables and seats are scarce - this isn’t a place to find a quiet corner; this is a place where you’re more than likely to be standing and people-watching. Tunes are provided by in-house DJs with deep house and soul classics in the mix, although the white JBL speakers the music is piped through are not going to trouble the neighbours. If it gets too much, and the weather permits, the relative serenity of the courtyard is a superb alternative. Staff are made up of many different nationalities and the management and the female servers are particularly good at what they do. Burgers, sharing platters and mezze dishes are available in the bar, or you can eat in the restaurant itself (you can even see if there’s a spare table from the bar). For a snack: bowls of salted peanuts or olives should do the job. Martinis, hi-balls and champagne cocktails take pride of place on the menu. Expect to pay £12-£14 a pop. Those with an intimate knowledge of this hotel will be well aware that if you head further down towards the reception desk, you’ll find the magnificent and covert Purple Bar, where the standard of the cocktails compares favourably to the best cocktail joints in town. At The Long Bar the quality remains high, but due to the sheer volume of the drinks and the demand at peak times, the Purple Bar shades it. Having said that, concoctions like the wintery Snow Bee martini (vodka, honey, apple and bitters), the eastern flavour of the Vesuvio (Belvedere vodka, lychee, ginger, lemongrass and chilli), and a finely balanced perfect Manhattan show cocktails are very much a forte here. Young, vibrant and fashionable, The Long Bar is a rare thing amongst 5-star hotel bars: it’s a party spot and a destination in its own right. Packed on a Friday night, unsuprisingly. Very stylish bar with lots of pretty people - I would probably go back, but maybe during the week to avoid the crowds. Champagne cocktails were tasty and the staff were attentive and polite. The Long Bar at the Sanderson hotel is very impressive looking, ultra chic and minimalist, with unusual looking furniture in the hotel entrance. The bar is certainly very long and you need to jostle your way in to get a space. The bar staff seem to know their stuff and can rustle up any requested cocktail in the blink of an eye. The Long Bar is a great establishment for people watching, highly amusing. All types can be seen posing at the bar, from wannabee fashion types, lawyers and accountants, the odd celeb and orange, bleach blonde older women on the look out for a wealthy catch. All in all, the long Bar is a great place, music isn't too bad either and an entertaining, fun evening can be had by all.